Fighters Do Their Best To Make The Weather Forecast An Accurate One! The weather forecast for this weekend in Las Vegas called for rain, thunder and lightning which was not exactly what ESPN was hoping for. As it turned out we got a little bit of the rain from Mother Nature, a little bit of lightning from Sugar, and a major dose of thunder from WBO Welterweight Champ Antonio Margarito(31-4,22 KO's). So as I was saying, a few scattered sprinkles began to fall just prior to the fight, but there was no sign of any ensuing thunder, and before the fight began, the rain had all but stopped, but the thunder was just about to be heard loud and clear! 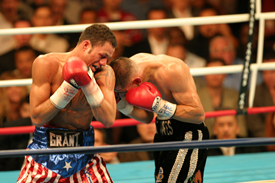 Challenger Kermit Cintron(24-1,22 KO's) came into the ring looking like he was ready to go and from the outset it appeared as if he was ready to make good on his earlier promises to rock the Champions world. But Margarito looked relaxed and through the first 3 minutes he was surveying the landscape, preparing to bring his storm cloud that was on the horizon. 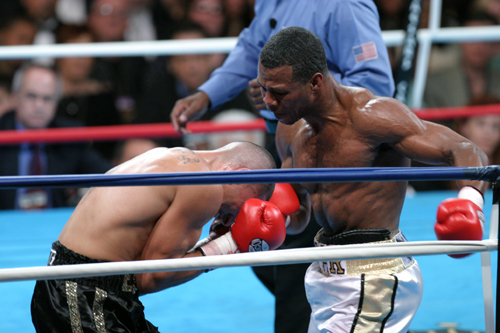 By the second round Antonio had found his distance and starts to land some effective punches that are nothing more than a sneak preview of the coming attraction. The two squared off for round three and it was clear that Margarito was gaining confidence as Cintron's inexperience started to get exposed for what it was, and that wasn't much. 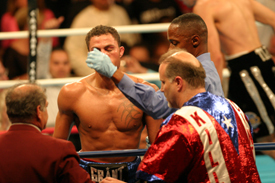 And to add injury to that insult, after the two exchange punches Cintron comes out with a nice gash over his right eye that will change the complexion of this fight permanently. The Champion did not let this moment go to waste and he jumped on Kermit with a swift and effective attack. 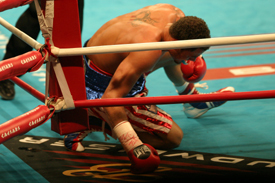 By the end of the round there is no doubt that Cintron had been hurt, but more importantly, he was scared. The fear was obvious as Cintron was throwing meaningless punches at the start of round 4, hoping to stay out of harms way! 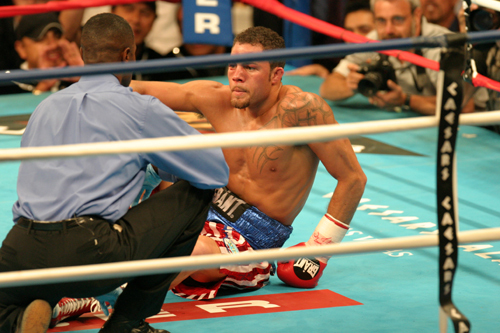 But that was just playing into Margaritos hands and he took full advantage of the situation, first by hurting and then dropping Cintron who beat the count but was on wobbly legs for the rest of the fight. Whether it was the blows that left his legs shaky or the fear of more punishment was irrelevant at this point. What was brutally clear was that Cintron had bit off way more than he could chew. 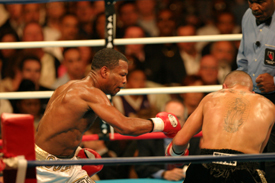 As round five began Cintron was in survivor mode and Margarito was moving in for the kill, and the more Antonio pressed the more it was clear that Cintron was in fear for his life, he was not tired, he was scared and he did not know how to deal with the situation at hand. 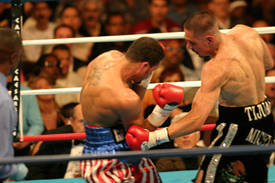 Margarito lands a sweet body shot and from there it's all but over. 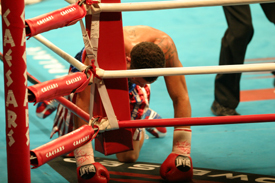 A right hand puts Cintron down and he barely beats the count of ten. The Champ once again jumps on Cintron who is trying to hold on, but to know avail as Antonio is landing with accurate blows. And it's just a matter of moments before Cintron goes down again, but this time it's more out of fear than anything else, fear of getting his head knocked off! With the fact that Cintron was hurt and scared becoming gravely apparent, his corner mercifully stops the fight at the 2:12 mark, as they knew their man was done. 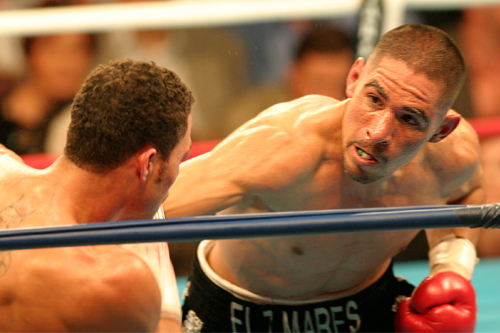 As Cintron wept in his corner a jubilant Margarito jumped into the arms of his team with the look of a fighter with a bright and lucrative future in front of him. 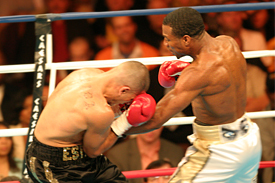 As we all know, you always see the lightning before you can experience the thunder, and with the storm clouds brewing that's just what we got on this card tonight as Shane Mosley(40-4, 35 KO's) made his triumphant return to the 147 pound division with a clear cut unanimous decision over David Estrada (18-2, 9KO's) with scores of 97-93, 98-91 & 99-91. In all honesty, those scores look a lot better on paper than the actual performance. Now before you all misquote me, hear this loud and clear, I agree that Shane won a clear unanimous decision, no doubt about it. But I think at least 2 of those scores were way off and I also believe that there is still something missing in Shane, he just is not the Sugar I remember at 135 pounds and I am not convinced that he will ever get it back. Was his hand speed there tonight? Yes! He was quicker than we have seen him in a while. But when you mix in way too much complaining to the ref, and an obvious lack of respect from the fans in attendance, I couldn't help but think that somewhere, somehow, Mosley has become a fighter in search of his identity, and in trying to reinvent himself at 147 pounds he has become a poor imitation of the Sugar we once knew. Time will tell, and Shane is as nice a guy as you would ever want to meet, I wish him nothing but the best, but after this evening I am not convinced that he can defeat a fighter like Champion Antonio Margarito. 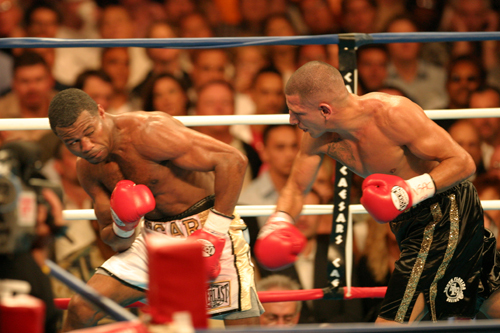 As to the fight itself, Shane did everything he had to, and he was in control of most of the fight. 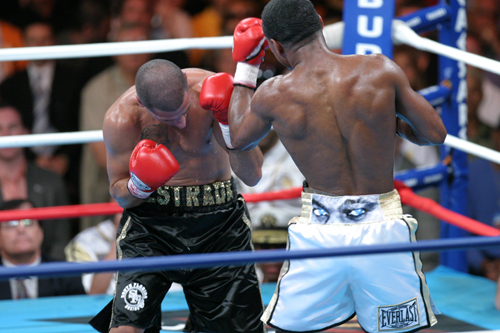 Estrada was game and won a few rounds but he was no match for the speed and accuracy of Shane's punches. Mosley showed some nice body work at times but was caught with more punches than I think he or anyone else in his corner had expected. Take nothing away from Estrada in this one sided scorecard, he was game and he did not give up or back down and at times he managed to land some pretty clean punches. But truth be told, Estrada is just not in the same league as Shane, never was, never will be. This was a fight that Mosley had to win, and he did! Was it impressive? The jury is still out on that one! In a Heavyweight fight that had but a few exciting moments, Calvin Brock (25-0, 20 KO's) takes a unanimous decision over Jameel McCline (31-5-3, 19 KO's) with scores of 96-94,96-93 & 97-93. 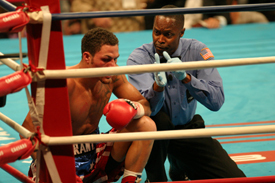 For Jameel, he once again finds himself losing a fight in which he had his opponent down in the early rounds. Brock, who got up off the canvas remains undefeated and it's on to bigger and better cards from here!